For more than 5 decades, Bushnell has been producing high quality optical products including rifle scopes and shipping them worldwide. The very first rifle scope this author owned was a Bushell 3×9 that he purchased for less than $30. After it was sighted-in, it held that aimpoint for a decade and only moved when the author did so for longer range shooting. Bushnell has consistently received industry recognition for design and performance. Bushnell has achieved this by developing and working with emerging optical technologies. In so doing, they constantly keep themselves one step ahead in the extremely competitive scope market. 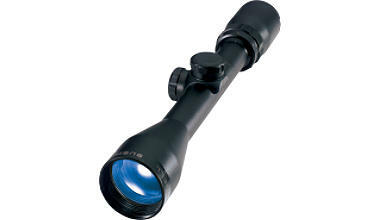 Their premium rifle scope is the Bushnell Elite 4200. This particular model is available with an adjustable objective in 6x24x40. It also has a fireflyte reticle which will glow in low light conditions to assist in aiming. The long reputation that Bushnell has enjoyed of producing quality products continues with the Elite 4200. This is a quality rifle scope for not a lot of money. An adjustable objective is incremented in yards and meters, giving the option of use as a sort of rangefinder. When hunting, this can be very useful. The 4200 has an infinity setting to set the objective up above 300 yards, which is useful when searching for small targets a great distance away. Like other premium rifle scopes, the Elite 4200 has been designed so that adjustments can be made without any specialized tools. The scale ring is capable of being set at zero and the shooter can set the 6×24 in 1/8″ increments. The Multi-x reticle this scope provides sharp and brightly lit images, even when using in bright sunlight. Another worthwhile consideration is the Bushnell Elite 3200 rifle scope. It includes Rainguard and all of the most popular Bushnell scopes features, including a quick focus and repeatable adjustments. This compact scope is available for around $200.